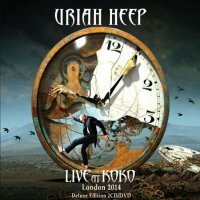 Although arguably a "greatest hits" of sorts, Uriah Heep's new live album 'Live At Koko, London 2014' should not be considered a collector's only item for the first generation of fans who praise their earliest Byron-Hensley era output. On their 2CD/1DVD live release, the band presents a cross-section of their material from their 1970 debut ('Gypsy') to their most recent album 'Outsider' ('One Minute', 'Can't Take That Away'). And it's not only this diversity that differentiates UH from many of their veteran peers, eager to base their gigs on a well-tried, tested and accepted set of vintage staples with the odd couple of new songs sandwiched between the oldies. Also unlike many of them, this band sounds equally tight and focused – and equally convincing – in whatever the group selects, from its earliest offerings to their latest selections. And it's the handful of Hammond and guitar adornments omnipresent in the band's sound song after song that builds a bridge between the classic and the contemporary. Several concerts on this particular tour were opened with 'Against The Odds' from Heep's 1995 'Sea Of Light' album and the London gig at Koko was no different. Embroidered with a heavy riff and a trademark chorus, it's followed by another punchy 1970's-tinted staple of the band's latter repertoire – 2008's 'Overload'. The band soon reaches back to their early period with the feisty 'Traveller In Time', followed by further classics in 'Sunrise' and 'Stealin'. This nostalgia trip ends when 'I'm Ready' from 2011 'Into The Wild' begins. However this choice, as well as Hammond-laden 'Between Two Worlds' and 'Nail On The Head', prove the Shaw-era repertoire is no weaker than that of his predecessors. And what's more, the two following tracks off of 'Outsider' match the rest of the set equally well – especially 'One Minute' with its piano-based, majestic opening that smoothly morphs into a full-blown Rocker. 'Into The Wild' is no slowdown either and yet another convincing performance from the night at Koko. Then, within the few first seconds of the heavy, lumbering intro to 'Gypsy', you know the truly "classic" part of the set has arrived. A furious rendition of 'Look At Yourself' turns into a drum solo, followed by Mick Box's blistering guitar showcase entitled 'Box Wah Box'. As would be expected, the very best is saved until the end; the audience's particularly enthusiastic roar precedes a fantastic performance of the group's arguable anthem 'July Morning' that is followed by the crowd sing-along 'Lady In Black'. The concert's grand finale consists of the Progressive flavours of 'Free 'N' Easy' and the mad-tempo of 'Easy Livin'' which brings the show and the album/DVD to its conclusion. If you don't take into consideration the 'Official Bootleg Series' albums released by earMusic, this is technically the first Uriah Heep live album since 2011's 'Live In Armenia'. Comparing the two, some may complain that the track lists of both are pretty similar, with the exception of a few selections – these, however, are just minor faults as '...Koko 2014' is a very good live release from a legendary band. It blends the classic vibe of '...Morning' or 'Gypsy' with the handful of newly created sounds from their more recent studio endeavours; it illustrates it all with colourful video footage of the gig on the DVD. 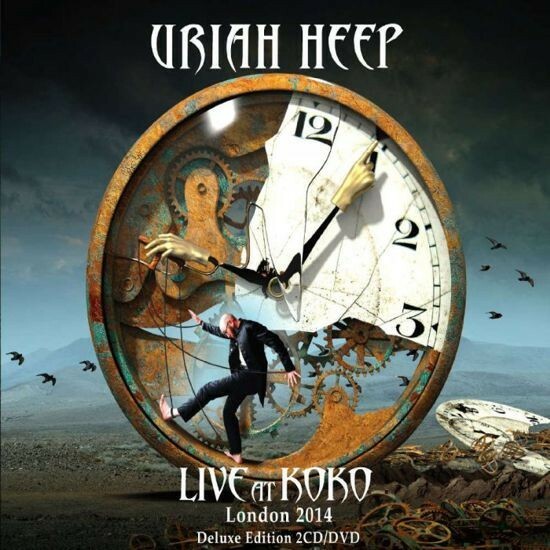 'Uriah Heep – Live At Koko 2014' is a good example of Box and his gang offering a tangible, vivid experience of what the band is on the live stage, especially for those who weren't lucky to see the legendary British Rockers on this most recent 2014 tour.